Like any other biryani, fish biryani also tastes very good. In my previous recipes chicken and mutton biryani, I have tried to explain how to cook it. From those recipes also, you can prepare fish biryani. But you have to be very careful, while cooking fish biryani, as fish is very delicate. This time I have used different spices for fish biryani. 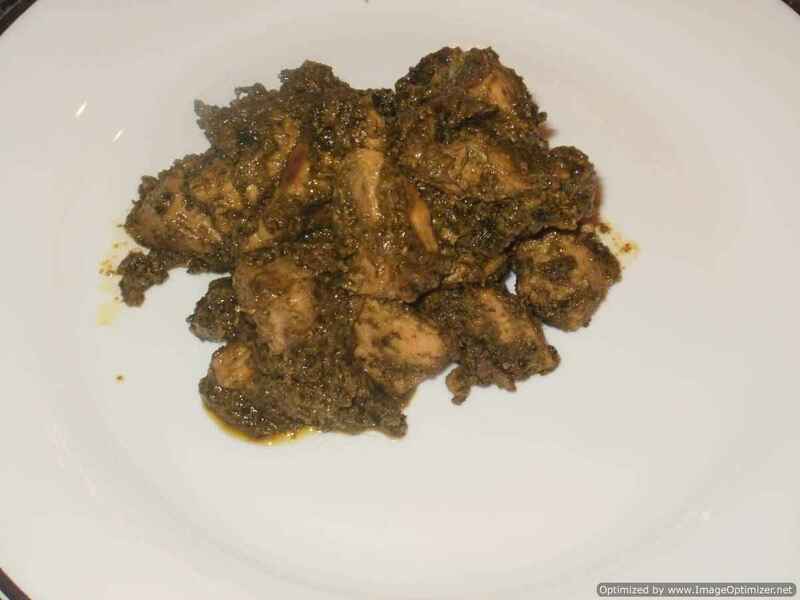 It is spicy and with a different flavour and taste also is quite different. This is because, I have added dill leaves or soya leaves, you can see it in the picture also. I always cook any food according to my taste and my likings of spices and ingredients, so you also can adjust or avoid if you don’t have or don’t like any spice. 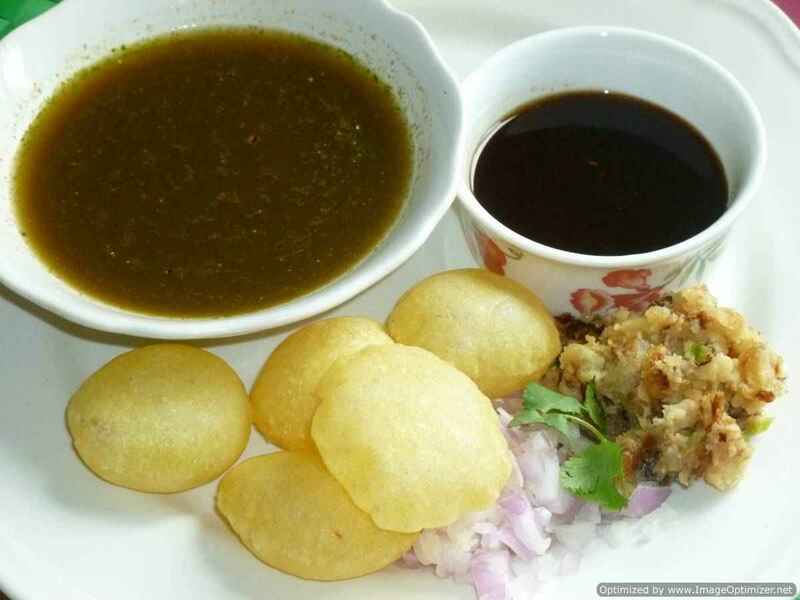 About oil or ghee it is up to you, how much to use, I am just giving you the tasty food which I like. 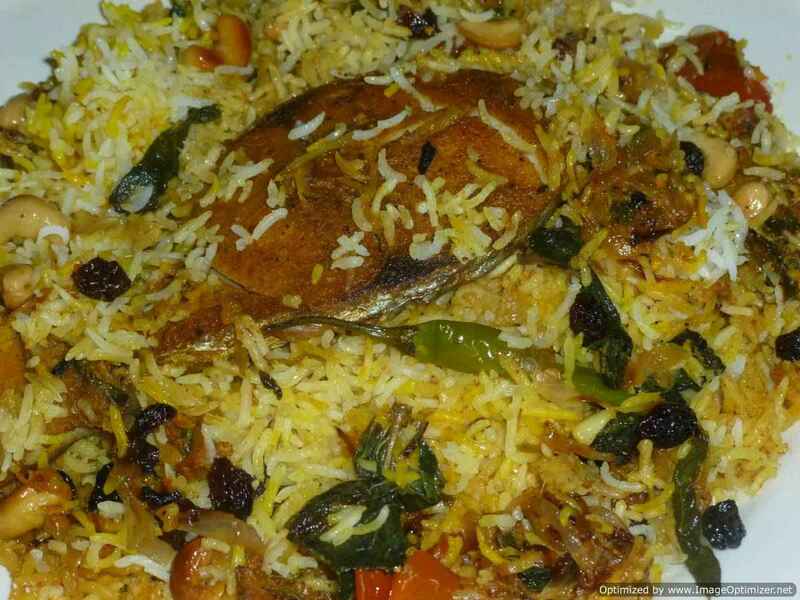 For fish biryani, you can use king fish, koduva (Tamil), seabass, tilapia, pompfret or any firm fish you like. You can use boneless fish also, but I have not used boneless pieces but with fishbones. I have used king fish, it has only one bone. You can cut the fish pieces in medium size as it will be easy to cook. Dill or soya leaves it has a very sweet fragrance and flavour. If you go and search about dill leaves in google, you will get lot of details. In my home my mother has cooked dill leaves with dal and in vegetable curries, very rare it is used in non-veg. It has a very strong flavour, if used more its impact in the vegetables will be more and you cannot taste or get flavour of the other vegetables. You can also look at my prawns biryani with dill leaves and dried prunes recipe. Chop mint and dill leaves and keep few for garnishing/layering the biryani. Optionally cut the tomatoes into medium size pieces. I sometimes use tomatoes and sometimes don't. For dry ground masala - Roast ajwain seeds for a few mins on a low flame until it is slightly roasted and releases aroma. Switch off and allow it to cool. Transfer the roasted ajwain seeds, kasuri methi and amchur powder into a dry mixer and grind it to powder. Take a big utensil, add oil. When it gets hot add whole spices cloves, cinnamon stick, cardamom, stir it for 3 secs, then add onions and fry until it is crispy and golden brown. It will take 10 - 12 mins. Stir occasionally. When the onions are cooked well, take 1/4 of the onion and keep it aside for garnishing. Keep the other 3/4 in a bowl for the gravy. Take the marinated fish from fridge 1/2 hr in advance before cooking. Heat the same vessel with remaining oil in which onions were fried. When hot, add the marinated fish for frying. Fry the fish on medium heat, do not turn the fish immediately. You can drizzle some oil in between on the fish if required. When all the fish pieces are cooked well on both sides, take it out and keep it aside. Fry the fish in batches, turn it carefully, as it can break. Cook the gravy in the same vessel, in which fish was fried. The idea is to get as much flavour of fish into the gravy as possible, can see the oil colour has changed. Now add the 3/4 of fried onion, which we kept in a bowl. Keep the vessel warm and mix with the remaining fish oil left. When the onions get hot, add ginger and garlic paste, and other spices including dry ground masala except curd. Stir it well for few seconds. Optionally add chopped tomatoes. Add 1/2 cup of water immediately and stir so that the spices do not burn. Cook for 4 to 5 mins few minutes until the tomatoes soften. Add curd and 1/3 cup of water immediately and stir, so that it doesn't curdle. Cook for about 5 mins. Keep stirring. Add dill leaves and mint and cook. Add 1 cup water immediately before it gets dry and mix well. Close the lid and cook for 10 to 12 mins. Stir in between. Now you can see that a thick gravy consistency is formed. Simmer the flame, add salt, fish pieces and green chillies. The fish pieces should be well immersed and coated with gravy. Optionally add about 1/3 cup of water if it the gravy is very thick. Close the lid and simmer for 10 to 12 minutes until you get to a gravy consistency with oil on top. The consistency should be such that it is enough to mix with rice. When the water starts boiling, add spices and salt first. Boil for about 5 mins and then add rice and cook for 5 to 6 mins only. The rice has to be cooked about 70% to 80% or 3/4 cooked only. Drain the rice and rinse under cold tap water to stop further cooking. While boiling, do not stir very often as the grains may break. The grains after cooking will be longer, but still raw. Take some gravy with the fish pieces and keep aside. 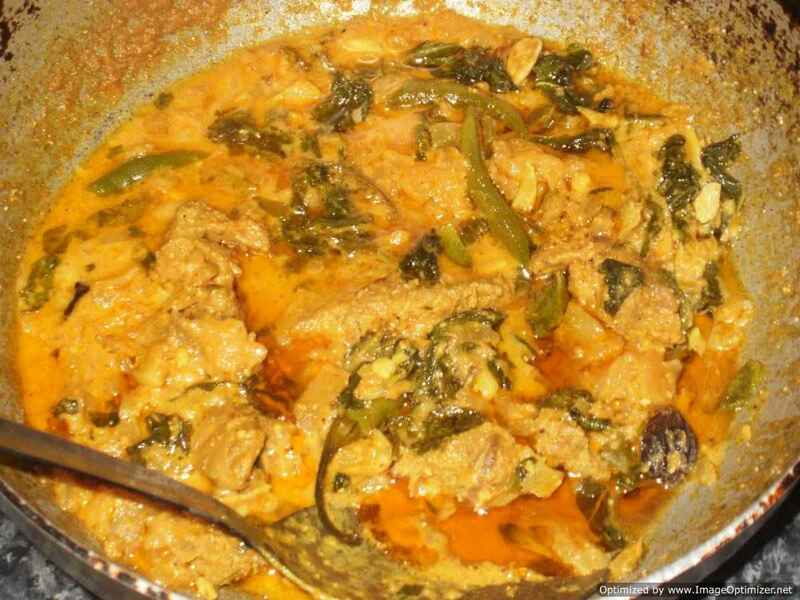 First some gravy with fish pieces is layered in the vessel in which the fish curry was cooked. Layer some rice on top. Put a pinch of saffron colour, few mint leaves and dill leaves. Drizzle 2 tbsp ghee. Then again put the remaining fish pieces and gravy which you kept aside. Layer some rice again. 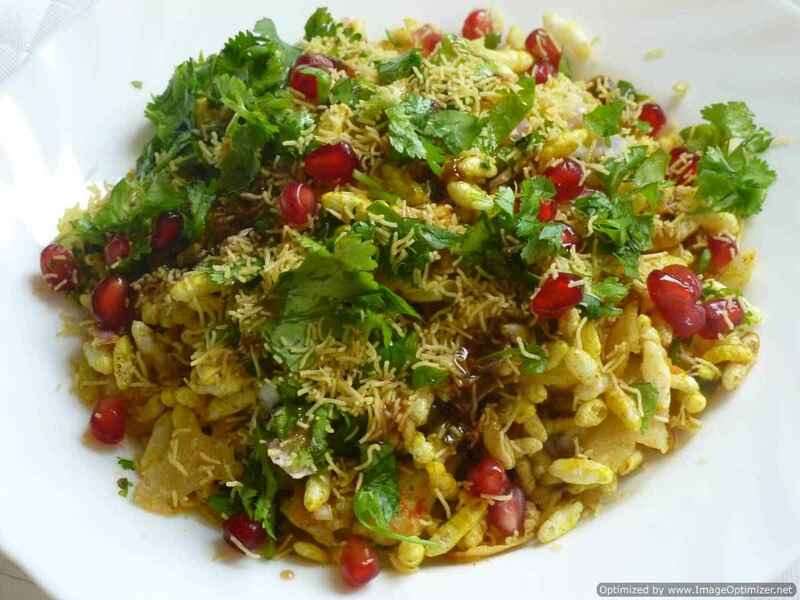 Sprinkle some saffron colour, mace and javithri powder, lemon juice, dill leaves, mint leaves, fried onion and the remaining ghee. Spread evenly. Heat the vessel in which you have layered the biryani for 5 mins or until you see a little steam escaping from the sides. Alternatively just keep your hand near the rice to check whether it is getting hot or not. If you are able to see some steam, from that point onwards quickly close the lid with aluminium foil or keep some heavy weight on the lid or close it with a cloth and then the lid. Simmer for 15-20 mins until the rice is cooked. Switch off. This biryani is spicy and tastes good also, goes well with any raitha, brinjal curry or any curry you want. You can reduce the chillies,if you donot eat spicy food or your chillies are very hot. If you want to reduce the oil, then reduce it. Its your wish, but the onion has to be roasted in oil or ghee well. Carefully add salt for the gravy and rice. Divide the salt quantity and put, it will be easy for you. Whenever I grind 300 gms of ginger and 300 gms of garlic paste, I have ground with whole spices. View my ginger and garlic paste recipe. If you do not like dill leaves, you can use coriander leaves instead. If you think that the quantity of dill leaves is more, you can reduce it too. Mix colour with 2 tbsp of water or with milk and put it on rice.